The 350 series of meters are the mid-range of meters from ND Metering Solutions. The Cube 350 is a 96x96mm, CT operated, panel mounted electricity meter which also has programmable VT input. The standard build is for a 5 Amp CT input, however a 1 amp input model can be ordered upon request. The IP meter is a standard Ethernet TCP/IP component designed for inclusion in industrial and office Ethernet networks. Depending on the hardware and settings of the network, access to the meter may be made within the local intranet or over a wider area network such as the World Wide Web via the integrated CAT5 socket. 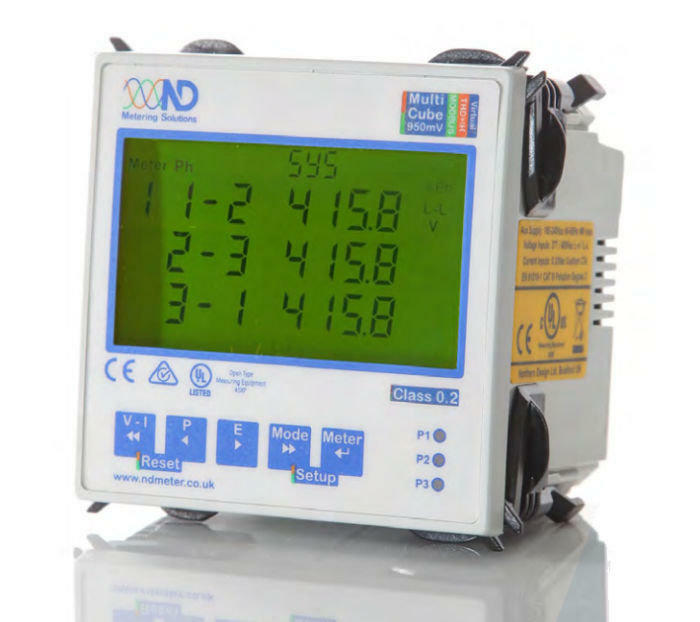 The ND Metering Solutions series of meters are the only range on the market that are manufactured in the UK and come with a 5-year warranty. This meter displays individual phase and total Active Power (W); Active Energy (kWh) is recorded to an accuracy better than class 1 and Reactive Energy (kVArh) better than class 2. It includes a resettable hours run counter (hr) and displays Frequency (Hz) In addition, to measuring Power Factor (pf) for each phase and the sum of all phases. Finally, it records Live to Live and Live to Neutral Voltage (V) and Current (I) on each phase. The THD add on includes Total Harmonic Distortion for Volts and Current on individual harmonics between the 2nd and 15th. This meter comes with RS485 Modbus and 2 pulse outputs for kWh and kVArh; both are configurable for both duration and rate. N.B. This meter can be pre-wired into an enclosure. Click here to see our full range of Enclosures, or click here to find out more about our Pre-Wiring Service. Are you happy for us to display this question on the website? Q: Does Rail350 meter show the "actual" total PF for any load connected to a 3-Phase feed? Does it actually measure the phase shift (angle) between voltage and current of all 3 phases and provide the total actual value of a reactive load? Further, I understand from the manual that PF measurement (< 0.95) would only be useful if the meter will read all 3 voltages (all 3 phases), while "Balance Voltage Mode" is NOT selected. Is my understanding correct? Power Factor is recorded over all three phases, so yes this can be for any load connected to it. It measures the actual phase shift between voltage and current for all 3 phases and provide actual value for active & reactive load. Yes you need all three voltages to measure the Power Factor.